The original cast iron water main within the project area was installed in 1948, 1951, and 1955. It has exceeded its useful life and has been prioritized for replacement. SGP Contracting, Inc., under contract with SPRWS, will replace the existing cast iron water main with ductile iron pipe via open cut excavation. This work is being coordinated in advance of mill and overlay improvements planned to be completed by St. Paul Public Works later this summer on Cleveland Ave. In order to prepare for the main replacement work, SPRWS crews will begin to lay out temporary water mains on Wednesday, April 24, 2019. These pipes will be used to supply residents in the area with water throughout the project. As the project start date approaches, SPRWS crews will need to access properties to connect temporary water mains to the water service. Generally, the temporary water main is connected to the hose bib where possible. SGP Contracting plans to begin the water main replacement work in mid-May. Around that time, residents should expect traffic and parking impacts to take effect. 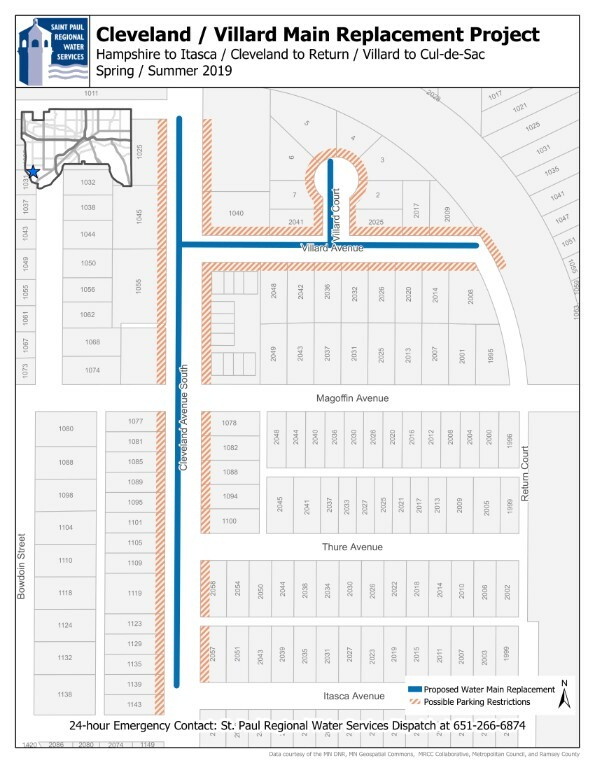 The contractor plans to begin installing water main at the southern end of Cleveland Avenue (near the intersection with Itasca) and will move north as the project progresses. We currently anticipate that water main replacement work on Cleveland Avenue will take approximately 1 month. Following the completion of work on Cleveland Avenue, the contractor will begin work on Villard Avenue and Villard Court. Work on these water mains is expected to take roughly 1 months as well. Cleveland Ave. (Itasca to Hampshire), Villard Ave. and Villard Ct.